The best way to keep up to date with Monaghan events, view pictures, videos, and our wise and witty pontifications is to visit our facebook page at facebook.com/monaghanpb. Monaghan Pipe Band is one of the oldest pipe bands in the United States, tracing its origins back to 1929. The Band's mission is to promote the music of the Great Highland Bagpipes through performance and the continuous development of skills. Based in New York City, Monaghan Pipe Band is not associated with any municipal or religious organization and so welcomes new players of all ages and backgrounds. Our members come from all five boroughs of New York City as well as the Greater New York Metro area. The Monaghan Pipe Band is a New York State Incorporated and IRS recognized tax exempt, not-for-profit organization. 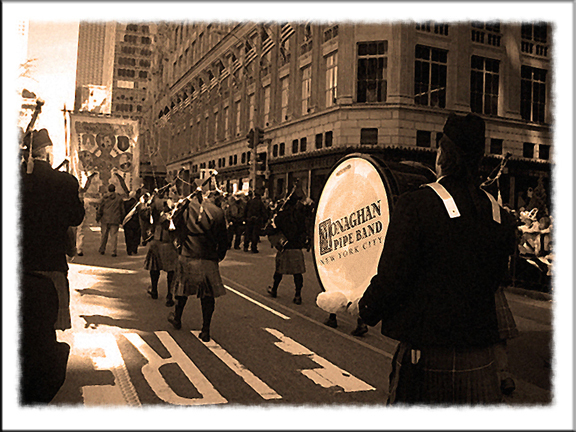 Monaghan Pipe Band maintains close ties with the local Brooklyn community as well as the Greater New York Metro area. The Band is a regular participant in community events and performs throughout the year at numerous parades, charity fundraisers, local graduations, weddings, concerts and festivals all over the Tri-State Area, including the world-famous New York City St. Patrick's Day Parade. Whether you need a solo piper, a mini band, or the full band for your special event, we can accommodate your needs. To hire us, call 917-686-4147 or send an e-mail to info@monaghanpb.com. We are always seeking new players of all ages and backgrounds, so whether you are a a seasoned veteran or a novice piper or drummer looking for lessons, give us a call at 917-686-4147 or send an e-mail to info@monaghanpb.com. Monaghan aims to reflect the vast diversity of people that comprise our great city, so no matter if you are Scottish, Irish, or Vulcan, if you love the sound of the pipes, we want you with us! Click here for more information on how to join the band!